Allan Hancock College has a new club for students hoping to learn more about the local agricultural industry and legislation that affects it. The Young Farmers and Ranchers Club became an officially recognized college group on Hancock's campus just this fall, according to Hancock ag instructor Erin Krier, who spent nearly a year working to bring the club into existence with the help of Teri Bontrager, an official with the Santa Barbara County Farm Bureau. The club's close partnership with the Farm Bureau gives participating students an opportunity to learn about the local agriculture industry directly from its leaders, Krier said. Along with real world work experience, students will be better able to make lasting connections with future employers, attain internships, apply for jobs, and get more involved in the local ag community. "I really wanted to get the kids connected to that industry piece so that they had some practical experience," Krier said, adding that not all students come from farming families and lack the personal ties that students who do often already have to potential future employers. 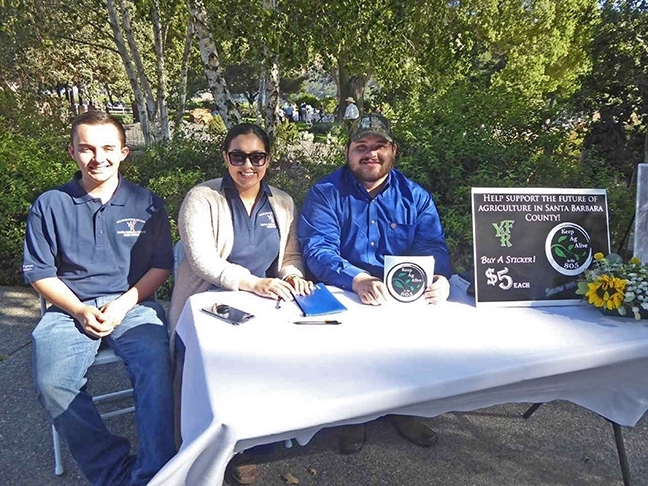 Members of Allan Hancock College’s Young Farmers and Ranchers Club sell $5 bumper stickers that read, “Keep ag alive in the 805,” at a harvest celebration in an effort to raise money for an upcoming trip to Sacramento. "A lot of getting a job is just knowing somebody," she said, "and many of our students don't have that connection already." 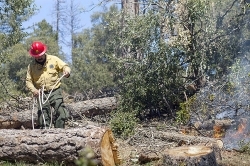 Although it's still new, Krier said the Young Farmers and Ranchers Club has already garnered about 25 members, who meet once a month and participate in various ag-related events. They're still mostly working at informational booths to get the word out about the club, and selling $5 bumper stickers that read "Keep ag alive in the 805," to raise money for an upcoming trip to Sacramento. At a Santa Barbara County Board of Supervisors meeting on Nov. 13, several club members spoke about the trip to the state's capital, where members plan to participate in "Ag Day" on March 19, tour the capitol building, meet with representatives, and learn about the laws and legislative processes that impact local farmers and ranchers. The three-day trip is expected to cost about $500 per student, and Krier said students are currently working on plans for a big fundraising event and reaching out to businesses that might "sponsor a student," essentially paying the cost of one student's trip. The event plays into Krier's larger goal of transforming her students into versed leaders of the ag industry by teaching them how law making really impacts farmers. She teaches about it during class, but, she said, "to actually see it in action is a totally different experience."